We dive into Nissan’s RB20DET specs to find out exactly what this engine is capable of. 1. When was it built? The RB20DET was first built in 1986, powering the R31 Nissan Skyline GT Passage, GTS Turbo, GTS-R and GTS Autech versions. 2. What is the displacement? The RB20DET displaces 1998 cubic centimeters. 3. What is the engine configuration? The RB20DET uses an inline six-cylinder configuration. 5. Is it turbo-charged? Yes. It uses a Garrett ball bearing T28 turbo charger unit on a ‘T3’ flanged exhaust manifold. 7. What are the cylinder head features? DOHC (Dual Over Head Cams), 24 valves (4 valves per cylinder). 8. What is the stock power output? 215 PS @ 6,400 rpm. 9. What is the stock torque output? 196 lb. 11. How tuneable is the stock engine? Highly tuneable. The stock engine is confidently regarded to handle up to 400 PS at the flywheel. 12. What do engine tuners think of it? When discussed with FC Tuning owner Steve Sadler he regarded the RB20DET very well as it likes to rev and easily makes good power. 13. Does it have “cool” factor? Many owners of cars that came with the RB20DET commonly swap the engine for the SR20DET as it is a more highly regarded engine. So maybe not..
14. How does it sound? 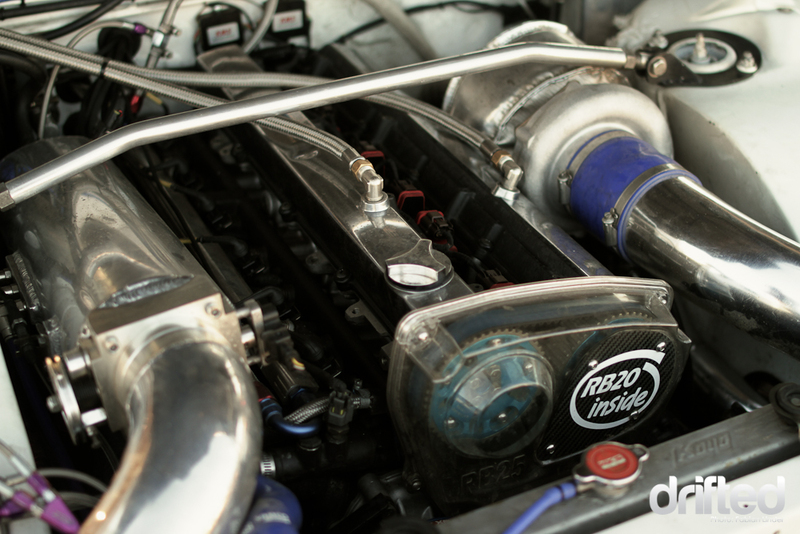 The RB20DET is a straight six engine so the exhaust tone is both smooth and high pitched. We think it sounds fantastic! 15. Are replacement parts hard to source? As the engine came in several older generation Nissan Skylines parts are available to source globally however they are not as abundant as more popular engines such as 1JZ-GTE’s or SR20DET’s. So now you know the RB20DET specs inside and out why not check out how it performs in a head to head battle against the mighty SR20DET? If you enjoyed reading about this Nissan RB engine then why not take a look at how it’s bigger brother – the RB26DETT – does against the 2JZ-GTE?